1. Wake up to hand made cards and a breakfast of French Toast (made only with egg yolks and no whites for Dr. Destructo - allergies). 2. Go to Windsor Farmer's Market and see cooking demonstration by dear friend Susan and her husband Jeff. Yummy! 3. Knit and be lazy. 5. Hang out and knit some more while husband makes the absolute best seafood paella in the world. Really. 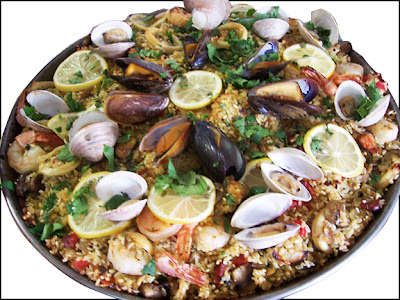 I know he is the Paella Master, but this one was transcendent! 6. Knit and be lazy. The highlight of the day? Getting to see Dr. Destructo eating and absolutely loving his first ever chocolate cake. The amazing recipe that Amy posted has no eggs and no milk! Dr. Destructo is allergic to both. We make other special desserts, but no good chocolate cake. He was so happy. I was so happy. We were all totally thrilled! And the cake was so freakin' good! Thank you Amy for posting it, and thank you Barbara for giving Amy the recipe! Hope you all had a wonderful day, too! edit at 1:15 am: Elizabeth had something to say about kids, puking and the timing thereof. So far the theory is holding true at our house! *sigh* Poor #1 son. What a great day it seems to have been - and I absolutely adore the cards and drawings, these are certainly things to treasure for a lifetime! And that food!!! Yummy!! Yay, so glad you had a great day! the food looks awesome! 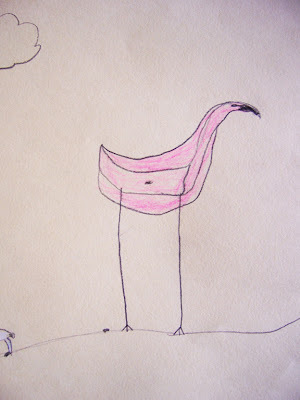 I just love the drawings- don't kids make you laugh? When they're not throwing up? 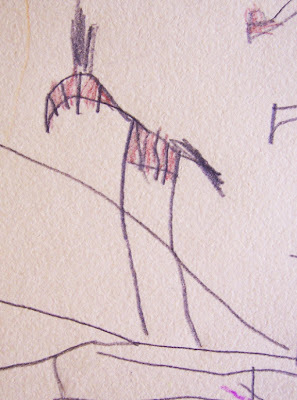 What could be more joyful on Mothers day than a flamingo AND a space-going-zebra?! Perfect. Those cards are too darn cute. And I love love LOVE Paella! Hey it looks like our Mothers days were somewhat similar...mellow,,,right comboe of knitting, relaxing and handmade gifts plus some SUGAR! The #1 son's drawing is really awesome (not to negate #2) but it is really special. Sounds spectacular! The food looks really great, too! Wow! DH made paella for me too for Mother's Day. Do the spouses know each other?!? Your sons' cards look very nice! I love the drawings! Your Mother's Day seems delightful. Nothing like relaxation to hit the spot. Got to love our artistic kids!!! Sounds like you had a heavenly mom's day! Happy mother's day! Sounds like it was perfect. That chocolate cake looks insane! 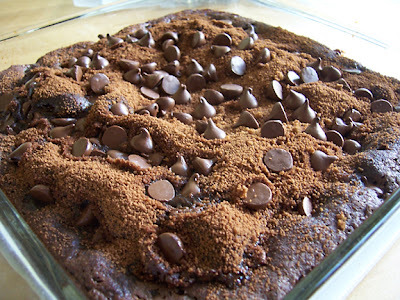 I'm lactose intolerant and a big time chocoholic, so I'll be trying that cake for sure! The hand made cards are fabulous. I sure hope son #1 is feeling better! sounds like a truly lovely day. :) and the paella looks so good, it's criminal. That's great! The cards look so sweet and I can only imagine the look on his face when he got his first bite of cake. That's a fantastic day! Very cute! And just think...it doesn't end. I'm still making things for my mom for mother's day. I love the "no cow, no chicken" description on Knitty--thanks for pointing that recipe out. My vegetarian daughter and son-in-law will be glad to see that one. Remind me to tell you of the time he took a creme brulee torch to some Valrhona, to see if melting it like that would work as a substitute for mixing the bars with cream to put between cake layers. It was, um, pyro cake. Those drawings are adorable, meantime. Hope everybody's feeling better by now. Glad you had a good day!--except for the ummm, puke problem. There is a fabulous vegan chocolate cake recipe in the new (ish) Joy of Cooking. Don't know the edition, but I can look that up if you want. It's easy to make and tastes good, especially if you make a powdered sugar or chocolate icing topping. (your icing could have margarine instead of milk?) My brother's allergic to milk, we don't mix milk and meat at home, and I've got some vegan friends. Email me and I'll be happy to help more! What a lovely day, puking aside. I hope #1 son is feeling better now. I'm so glad you found a nice chocolate cake recipe for the little one. It sounds like that just made your day. Oh what a wonderful day you had. I love sea food, your husband is a jewel. Hey,that cake looks marvelous. I am rushing over to Amy's to get it. I didn't get to go anywhere to eat (since I am not really eating these days) but the kids called and sent cards. The boys drawings are wonderful Rosemary. I miss those sweet pictures my 3 boys brought home to me. Refridgerator Art at the time.